Fit For Amazon Kindle 2 （ II），AmazonKindle DX. We stand behind our quality products. Due to the secure reasons. Fit For Amazon Kindle Paperwhite 2nd Gen (2013). Fit For Amazon Kindle Paperwhite 3rd Gen (2015). If we cannot find your item. We do not want to give you a bad buying experience. We stand behind our quality products. Amazon Kindle Paperwhite 2nd Generation (2013) DP75SDI & 3rd Generation 2015. ◆ Standard capacity: 1420mAh (5.25Wh). ◆ 100% OEM. Fit for Amazon Kindle 2 D00511 D00701 & Kindle DX D00801. Model NO. :S11S01B S11S01A. 100% OEM Battery. Compatible with Amazon battery models. 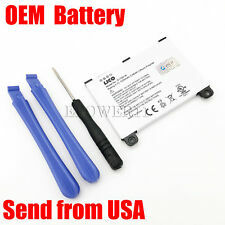 100% OEM ORIGINAL Battery. Cell Qty:1. Cell material: Li-ion. Capacity:1530mAh = 5.66wh. OEM Battery For Amazon Kindle PaperWhite 2nd Gen(2013 Model) / 3rd Gen(2015 Model) - MC-354775-05. 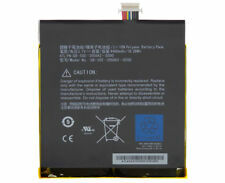 (58-000035(11cp4/82/138) 26S1001 S2012-001-d fit forKindle Fire HD 7" X43Z60 2nd Gen Tablet. to picture). Compatible with the following Amazon Kindle models: 2013 2nd Generation Amazon Kindle Paperwhite DP75SDI e-Reader (Large Amazon Logo on Back). nd Generation Amazon Kindle Paperwhite DP75SDI e-Reader with Installation Tools. Model Number: 3555A2L. 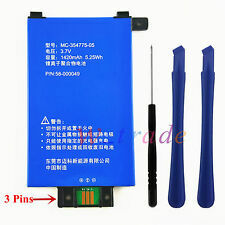 This is a genuine 3.7V 4400mAh 16.28Wh lithium-ion battery for the Amazon 1st Generation Kindle Fire 7" D01400 tablet. This battery is being sold with our 1 year warranty. Compatible with: 1st Generation Amazon Kindle Fire D01400 7" Tablet (. ). This item doesn't fit for Kindle Fire HD 8.9"
For Amazon Kindle 2 WIFI D00511 Kindle DX D00801 DXG. Amazon Kindle Paperwhite EY21. Capacity: 1420mah. Fit Part number. Battery for Amazon Kindle 2 II eBook Reader Book eReader 2nd Generation Gen DX S11S01A DR-A011. Battery Amazon Kindle 2 eBook Reader 2nd S11S01A. Amazon Kindle II DX eReader. Amazon Kindle 2 eBook Reader. Compatible Models: Amazon Kindle 2, Amazon Kindle II, Amazon Kindle 2nd Generation, Amazon Kindle II DX. Item Title: Amazon Battery For Amazon Kindle 2 II Kindle DX WiFi eBook Reader White. Condition: New. Amazon Kindle 3, Kindle 3 Wi-Fi. Kindle 3 3G, Kindle 3 Graphite. Replaces Amazon Kindle. Banshee 30L-BS. Capacity : 1900mAh. Volts :3.7 Volts. Fit for Amazon Kindle Paperwhite 2nd Gen. Compatibel part #. Compatible with the following Amazon Kindle models: Kindle 2 D00511, Kindle 2 D00701, Kindle DX D00611 (White Model Only), B003B0A294563B74 & C05S01H0024N23. Amazon Kindle 2 ,Kindle II, Kindle DX. Not for use with Kindle Fire 2 Wi-Fi. S11S01A - CM2-CS160 3G Version Only . Volts :3.7 Volts. Fits and Replaces. Fits & Replaces OEM P/N. 170-1012-00 / DR-A011 / S11S01A / EBZ300AM. HQRP trademarked products. Amazon Kindle 2, Kindle II, Kindle DX. Amazon Kindle 2 / II, DX. NOT COMPATIBLE WITH Kindle 2 WiFi Version. Battery Type: Li-Ion;. B005, B009, D00511, D00601, D00801 Digital Book E-reader. - Amazon Kindle 2 B005, B009, D00511, D00601, D00801. 1530mAh Battery compatible with Amazon Kindle 2. HQRP trademarked products. NOT COMPATIBLE WITH Kindle 2 WiFi Version. Amazon Kindle Paperwhite 2nd Gen (2013) DP75SDI. Amazon Kindle PaperWhite 2nd Gen 6". For Amazon Kindle PaperWhite DP75SDI 6" 2013 2014 2nd/3rd Generation. Battery Type : Li-ion. 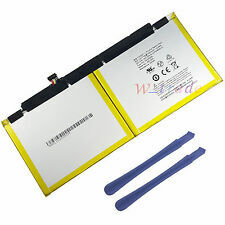 1.Li-Ion Laptop Battery 10.8V and 11.1V are in common use. New MC-354775-05 Battery 58-000049 For Amazon Kindle PaperWhite 2nd Gen 6". Type: Battery. 1×Battery tools. S11S01A - CM2-CS160 3G Version Only . Amazon Kindle 2 ,Kindle II, Kindle DX. Not for use with Kindle Fire 2 Wi-Fi. Volts :3.7 Volts. Fits and Replaces. Fits & Replaces OEM P/N. · Compatible with the following Amazon Kindle eReader/Tablet models: Kindle 2 D00511, Kindle 2 D00701, Kindle DX D00801 (Black), B003B0A294563B74 & C05S01H0024N23. If you need tools to take apart your Kindle, we also have atool set available here. We won't keep you waiting! New OEM Battery 58-000049 MC-354775-05 For Amazon Kindle PaperWhite 2nd Gen 6"
Amazon Kindle Paperwhite 2nd Gen (2013) DP75SDI. For Amazon Kindle PaperWhite DP75SDI 6" 2013 2014 2nd/3rd Generation. Capacity : 1420mAh. Amazon Kindle PaperWhite 2nd Gen 6". Battery Type : Li-ion. 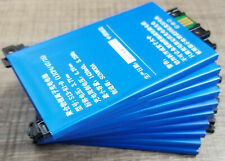 1.Li-Ion Laptop Battery 10.8V and 11.1V are in common use. For a kindle fire 7.". Amazon Kindle Paperwhite 2nd Gen (2013). Battery for Kindle Fire by Amazon D01400 - 3555A2L DR-A013 GB-S02-3555A2-0200. AMAZON Kindle Fire D01400. Type: Li-ion Battery. Check Out Now! We do NOT accept any foreign currency. It is important to keep your Kindle 2 battery charged so your device does not power down when you are in the middle of enjoying a good book. There are several different types of batteries to choose from, but they must be compatible with the Kindle. Some batteries offer different features such as faster charging rates, but no matter what you want, there is a broad selection on eBay. 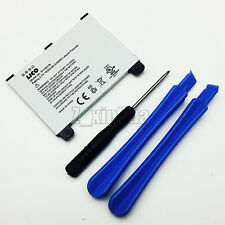 Are there different batteries available for the various Kindles? Not all Kindles use the same type of battery, so make sure you search for the Kindle 2 batteries. You also want to consider the difference between OEM batteries and non-OEM batteries. OEM stands for the original equipment manufacturer, which means that the battery is the same as the one that came in your original Kindle. With a non-OEM battery, a different brand makes the battery, but it is still compatible with a Kindle 2. What features should you look for in your Kindle 2 battery? Battery life: The Kindle 2 battery life can vary depending on several factors. Some batteries last longer than others, but there are things you can do on your Kindle to preserve the battery life like plugging it in for consistent charging cycles. Voltage: The voltage amount can vary, although 3.7V is the most common amount for the Kindle 2 battery. mAh: The milliamp-hour measures the energy capacity of the battery and can also vary from 1500 mAh to 4400 mAh. Type of battery: You must look for a lithium-ion battery to be compatible with your Kindle 2 battery. How can you maximize the charge in your Kindle's battery? Even if you read all day, it's hard to drain the battery, and as it is with other devices, you won't have to charge your Kindle every day. However, there are a few things you can do if you're going to be away from a power source for an extended amount of time. 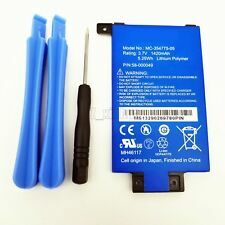 If you are looking for a battery that is compatible with your Kindle 2, you must search for a lithium-ion battery, specifically, on eBay. Lithium-ion batteries are rechargeable while lithium batteries are not. It is necessary to recharge your Kindle 2 battery every few days, so you need to ensure you look for the right battery type. However, lithium-ion batteries do have a much shorter shelf life, which is why you may need to replace your Kindle 2 battery every few years. Lithium-ion batteries can also come into many shapes, which makes them ideal for portable devices such as the Kindle 2. Content provided for informational purposes only. eBay is not affiliated with or endorsed by Kindle.